This summer I’ve put the smoker on my backyard deck to good use. I’ve made beef brisket, chicken, spare ribs and even grilled fish with it. We’ve enjoyed the variety of meat and side dishes that go with each. Summer barbecue season is thoroughly enjoyable. There are as many forms of barbecue as there are people who make Barbecue. You can even spell it multiple ways depending on where you live. Barbecue, barbeque or simply BBQ. Which is the right way to BBQ? What meat makes the best BBQ? Do you use sauce or rub, and if you use sauce is it vinegar based or catsup – or it is ketchup – based? When people ask me what is the best I often answer – it depends on what you like. Come to think of it, this sounds a lot like the online learning community. Greg, what is the best way to _____? If you’ve read my blogs you know my answer. “Well, it depends on many things including what you need to accomplish.” Let’s take the case of video learning. What is video learning anyway? Let’s look at what the experts say. Are others using video learning successfully? One only needs to take a look at what the following organizations are doing to understand the power of video learning: Khan Academy, TED Talks, Lynda.com, YouTube, Howto, DIY Network, VideoScribe, etc…. What is the “best way” to use video learning? Once again, what do you want to accomplish? You can deliver a simple video of a lecture, a slideshow synchronized with audio, screen captures, screen captures with an opportunity to enter in your own information, a video with an opportunity to answer questions, or a video with a button that timestamps when you notice something and then comment on it. Video learning can be used for trainings such as flipped classroom use, soft skills training, computer data entry or web application usage training, or customer service engagement training. The list can easily be expanded as your needs dictate. 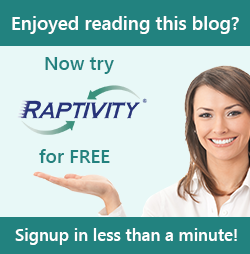 How can Raptivity help you? The video player gives the learner control over play, pause, forward, rewind, and volume options. Often you can have multiple videos available for playing presented for selection as thumbnails, in cubes, or embedded within other interactions. Captioning can be at either the bottom of the video screen area in a scrolling ticker format or in different segments at the top or bottom of the screen. You can synchronize text with videos in the form of bullets or longer text blocks. Video interactions can be set up to automatically pause when textual or audio content becomes viewable. This gives the learner the ability to reflect upon the presentation while reading or listening to the textual content. Learners can actively interact with a video using questions and feedback that appear during breaks in a video presentation. Additional navigation links (quick links) to selected areas (tags) within a video can be added in addition to the normal video player buttons. Having a collection of video learning interactions available to you through Raptivity Essential or Suite enables you to effectively reach your learners in different and engaging ways, thereby increasing the educational benefit of your output. Remember, there is no programming needed - just selection of options within the framework of Raptivity.